WARRENSBURG, N.Y. (NEWS10) – The bobcat saved from the Hudson River last year is once again running wild. This is “Bobbie.” He was found last Labor Day drowning in the river. Bobbie was brought to Schroon River Animal Hospital for initial treatment. He quickly outgrew the first enclosure and was moved to a custom built one. Before he was released on Monday, Bobbi was taught how to hunt for himself so he can survive in the wild. Bobbie came in on Labor Day 2015 after he was found at roughly 2 to 3 months old drowning in the Hudson River. He was brought in to Dr. Brian and Cara at Schroon River Animal Hospital for initial medical evaluation and treatment. When he was found he weighed in at 3 ½ pounds and didn’t have any of his canine teeth in yet. Later that week he was transferred to our partners at Outpost #4 Wildlife Rehabilitation where he was kept in a custom built enclosure. Bobbie did very good with rehabilitation and within 6 weeks he outgrew his enclosure and needed something bigger. After he was moved to a bigger enclosure the rehab process continued. He started getting his teeth in and soon had to be taught how to hunt…and eventually kill for his food. He grew to be approx. 20 lbs at the time of his release and was certainly ready to find his freedom. There were a number of people and organizations involved in helping him rehab and do the release. Rehabbing is a team effort for each animal that we bring in. The Atlantic sturgeon, prized for its caviar-making roe and drastically overfished in the Hudson River, is making a comeback. The state Department of Environmental Conservation says the river’s sturgeon population — protected for the past 20 years — has reached a 10-year high, according to a joint federal and state survey released Wednesday. “We are cautiously optimistic that, with our continued vigilance and efforts to protect this species, Atlantic sturgeon will have a secure future,” DEC acting Commissioner Basil Seggos said in a statement. The large, whiskered fish, which can weigh 500 pounds or more, were once plentiful in the Hudson, said Rutgers University marine scientist Thomas Grothues. In 1898, fishermen netted more than 500,000 pounds of sturgeon. The Hudson fishery declined through the last century, to annual catches of 33,000 pounds or less, due in part to a misunderstanding of the sturgeon life cycle, Grothues said. Sturgeon can live up to 60 years, he said, though the females don’t spawn until they are 16 or older and weigh about 90 pounds. The fish’s slow sexual maturation wasn’t discovered until the mid-90s, by which point New York’s fishing regulations had already set a 5-foot minimum catch limit on sturgeon, allowing juvenile fish as small as 50 pounds to be caught. In 1996, as the population continued to dwindle, New York State imposed a total ban on sturgeon fishing. Two years later, the Atlantic State Marine Fisheries Commission imposed a 40-year ban for all coastal waters. In 2012, due to the slow pace of recovery, the National Marine Fisheries Service designated Hudson River sturgeon as endangered. The rebound in the past decade has been significant, with the DEC reporting that it recorded an average of nine juvenile sturgeon per 10 nets in 2006 surveys and 68 per 10 nets in 2015. “The thing about sturgeon is that they carry so many eggs that they have this immense capacity to reproduce,” Grothues said. “If a lot of them make it to reproduction age, the stock could rebuild itself pretty quickly.”An assessment of sturgeon stock along the coast is scheduled to be completed in 2017 by the Atlantic fisheries commission. PURCHASE DISCOUNTED PRE-SALE TICKETS ONLINE FRIDAY, DECEMBER 18! (Pre-sale tickets are refundable if the event is cancelled). This annual event is held at State Line Lookout in the Palisades Interstate Park in New Jersey around the first weekend in October and features presentations of live birds of prey by the Delaware Valley Raptor Center. Admission is free. Boaters and Orange County sheriff's deputies rescued an injured bald eagle from the Hudson River Saturday, the sheriff's office said. HIGHLAND FALLS -- Boaters and Orange County sheriff's deputies rescued an injured bald eagle from the Hudson River Saturday, the sheriff's office said. The Orange County Sheriff's Office said deputies Anton Schmitt and David Sagala were on marine patrol on the river when they came upon a stationary boat near the near the Bear Mountain Bridge about 3:45 p.m. The boat's occupants were trying to remove the injured eagle from the river. The deputies helped rescue the bird and took it to the Bear Mountain dock, where a certified wildlife rehabilitator took custody of the eagle for evaluation and treatment. Marine units from the state Park Police and Westchester County assisted in the rescue. 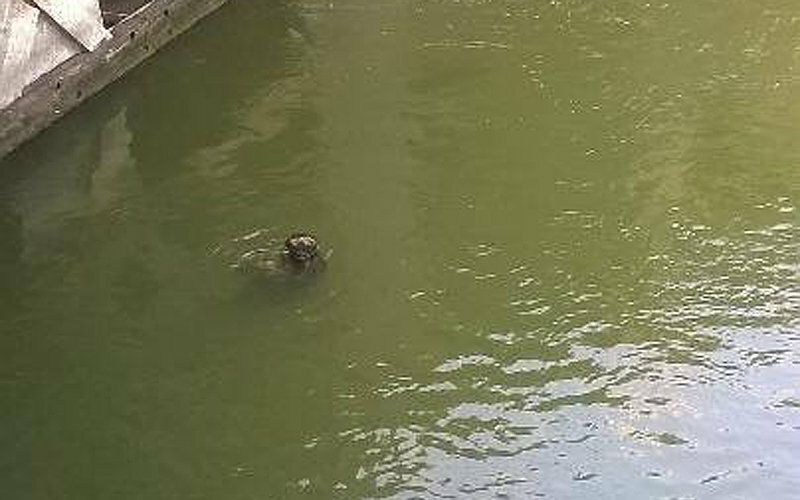 Seal Goes Up The River..
A food-seeking seal swam up the Hudson River over the weekend and was discovered Saturday in a lock in the Erie Canal near Albany. In a Facebook post, an employee with the state Canal Corporation says they had "a special visitor at Lock C-1." They say the seal swam up the river and into the federal lock at Troy before ending up on the Champlain Canal. Robert DiGiovanni, Jr., executive director of the Riverhead Foundation, tells Politics on the Hudson that the seal was previously tagged. The seal's yellow tag matches the ones the foundation puts on animals that have washed ashore in the past. DiGoivanni also says the seal is healthy and probably followed the Hudson River for food, which has happened before. "There's definitely food in the Hudson," he tells PolHudson. 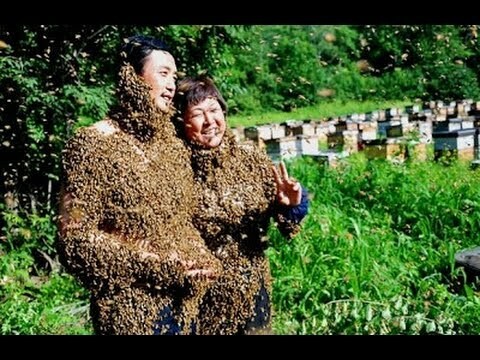 "So that's probably how it would go; it was just probably following whatever food it has." DiGiovanni encourages people who see the seal to keep away from it and report its whereabouts to the group's hotline at 631-369-9829. The bald eagle, Haliaeetus leucocephalus, is one of New York State's most impressive residents and the only eagle found solely in North America. The sight of one of these majestic birds soaring against a bright blue sky is enough to make anyone pause. Fortunately, this sight is becoming increasingly common. With a length of 30 inches, a brilliant white head and tail, and a wingspan of up to 84 inches (seven feet) this bird is hard to miss. Juveniles lack the distinguishing white feathers of the adults, but are brown with varying degrees of white spots on their body, tail and underwings. Individuals reach maturity and develop the adult plumage at about five years old. Eagles weigh between 8 and 14 pounds; females are slightly larger and heavier than males. Bald eagles are also remarkably long lived birds and have been known to live for 30 years in the wild. Humans' relationship with the bald eagle has been a rocky one. We adopted the bald eagle as our national symbol in 1782 for its perceived strength, much to the chagrin of Benjamin Franklin. He felt the eagle was of "bad moral character" and thought the wild turkey would be a better choice. Eagle populations were decimated by widespread use of pesticides and habitat destruction. By the 1960s, bald eagles had been nearly extirpated from New York State. 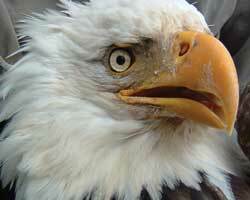 Bald eagles were also erroneously thought to be a threat to livestock, and many were killed. In reality, bald eagles feed mainly on fish. Their excellent vision allows them to spot a fish in the water from as much as a mile away. Eagles can only carry about 5 pounds in flight, and eagles have drowned trying to carry off a fish that was too heavy. In winter, eagles will also eat mammals, waterfowl and carrion. Bald eagles first received specific protection in 1940. The Bald Eagle Protection Act prevented the killing, possession or trade of the national symbol. Eagles are also protected by the Migratory Bird Treaty Act and the Endangered Species Act. They were officially listed as federally endangered in 1978. In 1995 the bald eagle was upgraded to threatened status, a testament to its remarkable comeback. In 1976, DEC began its bald eagle restoration program using a technique called "hacking." This technique involved taking eaglets from wild nests and transporting them to a release site where they were raised in artificial nests. The hope was that when the eagles matured, they would return to the area where they were raised to nest and become breeding birds. This program proved to be a huge success and served as a model for reestablishment programs around the country. The program ended in 1989 when state biologists determined that the released birds were reproducing successfully on their own and could continue the growth of New York's population naturally. New York now boasts 94 nesting pairs throughout the state. Eagles generally choose to nest in large trees near water and pairs will remain together until one partner dies. They will often use the same nest year after year, adding to it each breeding season. The typical nest averages five feet in diameter, but after repeated use it may exceed eight feet in depth and weigh more than a ton. Nesting pairs generally produce one or two eggs a year. The incubation period is about 35 days and eggs generally hatch in late April or in May. Although you can see bald eagles in New York at any time of year, some of the best opportunities are in winter. As lakes and rivers begin to freeze in northern latitudes, eagles leave their breeding grounds in search of open water. Because New York provides significant amounts of open water and food, our winter eagle population swells to more than 300 birds, making the chilliest months of the year the best for eagle viewing. Eagles require open water to find food. There are many sites across the state that provide ideal winter habitat and also afford excellent views of these creatures. The main sites are along the Upper Delaware River, the Hudson and the St. Lawrence Rivers. For specific viewing locations, see the "If You Go" box at the end of this article. Remain inside your vehicle. People on foot disturb eagles and cause them to fly. Refrain from loud noises, honking horns, slamming doors, etc. Leave your pets at home. Respect private property and restricted areas. Eagle sightings are more likely in the morning or at dusk when they are most active. Bring binoculars and/or a spotting scope with a window mount. Remember: harassing, disturbing or injuring a bald eagle is a federal offense and carries a penalty of up to $20,000 and/or one year in jail. Generally, sightings of bald eagles needn't be reported, but there are certain times when you should notify authorities. According to DEC's Endangered Species Unit, if you see more than four eagles after 3 PM, if you observe eagles with colored leg bands, if you observe an injured or dead bird, if you spot a nest, or if you observe anyone harassing, disturbing or harming an eagle, you should notify your regional DEC office. In any case, count yourself lucky to be one of the few who has seen our national symbol in the wild. For further reading, see: Where Eagles Soar... In New York State in the December 1996 issue of the Conservationist. You may also find more information by visiting DEC's website at http://www.dec.ny.gov/ and use the search words "bald eagle facts." Read Back from the Brink in the April 2005 issue to learn about New York's other avian success story, the peregrine falcon. Iona Island in Westchester County. Go to the scenic pull-off along Route 6 south of the Bear Mountain Bridge on the east side of the Hudson. DEC maintains two, well-marked viewing areas in the Mongaup Valley on the Rio and Mongaup Falls reservoirs (off NY Route 42). There is an information/observation booth at Mongaup Falls. See http://www.nps.gov/upde/eagles.htm for more information. 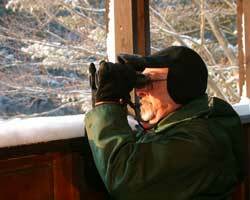 Eagles can also be found at New York's two upstate national wildlife refuges. The bald eagle isn't the only eagle species that can be found in the Empire State. The golden eagle, Aquila chrysaetos(pictured above), can also be seen in New York, although they are much rarer. They have never been abundant in the eastern United States, and had succumbed to many of the same pressures that decimated bald eagle populations. 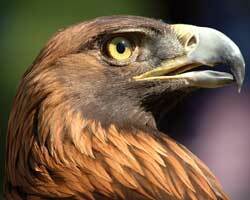 The golden eagle has been extirpated as a breeding bird east of the Mississippi River. Currently, they are not known to nest in New York, but may be seen passing through during the spring and fall migrations. For more information on golden eagles, visit http:www.dec.state.ny.us and use the search words "golden eagle." Saturday, October 25th (rain date Sunday, October 26th) 10:30 am at the bear den to 3:00 pmTrailside presents a not-so-scary alternative for the spookies of seasons. At 10:30 am, make spooky snacks for the black bears. 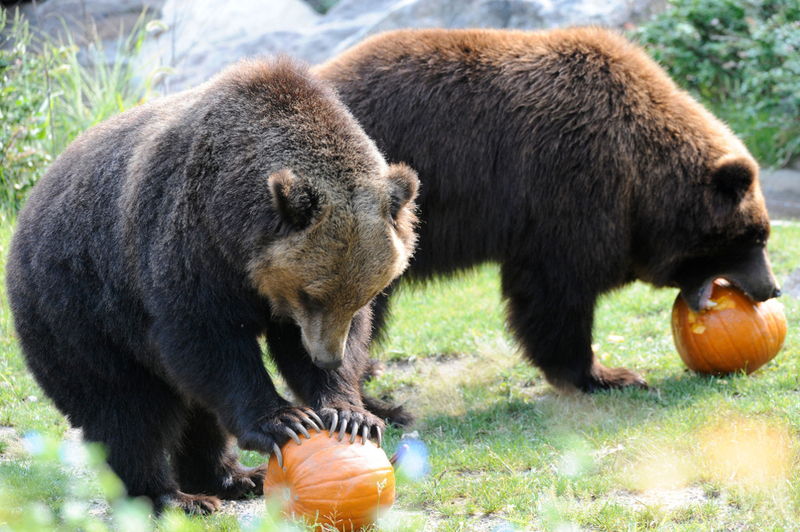 At 11 am, watch as the zookeepers let the bears loose on the tasty Halloween decorations. Touch real animal skulls, see stuffed specimens in the Nature Study museu, make autumn crafts and learn about bats and our not-so-scry owls and vultures. Lots of family-friendly fun and activities! Parking at Bear Mountain State Park $8/vehicle Admission to Trailside: suggested donation $1/person.